When you make the choice to live at Nichols Village you are committing to an independent lifestyle filled with abundant opportunities that will maximize your long term health and wellness goals. In support of your commitment Nichols Village makes available to you optional services through the Coordinated Home Care program. The Coordinated Home Care Program - Two well established companies, Home Health VNA and Right at Home have an office conveniently located within the Woodburn Manor at Nichols Village, and if needed, you may choose to contract directly with them. Their professional home care specialists are dedicated to our Nichols Village community and provide services to residents within the comfort of their own apartments or cottages. 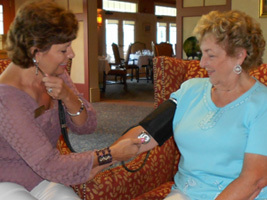 Home Health VNA - provides "skilled" services such as nursing care and physical, occupational, and speech therapies. When ordered by your physician these skilled services are covered by Medicare. Right at Home - provides "supportive" services such as meal preparation, bathing, dressing, medication reminders and companion care. These services may be used on an as-needed, fee-for-service basis, and is private pay though may be covered by long term care insurance or Veteran's Aid and Attendance benefits. How would "The Coordinated Home Care Program" benefit me? Supports you in living a healthy and rewarding lifestyle while maintaining your independence. Assures that you may remain safe and comfortable in your own home at Nichols Village. Assists in preventing unnecessary hospital stays. Helps to prevent or postpone a move to an assisted living or a skilled nursing facility. Assists you with successful "Aging in Place"